Parties are human organizations – they constitute a structure of power relations among humans…….. After six decades of Independence and self-rule, poor remained poor – while a new class of elites – money rich politicians and power domineering families have arisen. In India, every party flexes its muscle and exhibits its strength by organizing rallies and meetings…. .. the crowds that gather clearly exhibit the backing that the party enjoys~ and in some ways provides the party the muscle to negotiate for seats and power…. 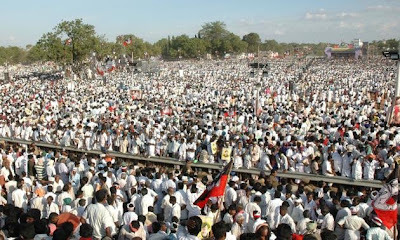 ~ and to have that bargaining power – political parties do all that is required, spend huge money in ferrying crowds…. They come by all means – by lorries, tractors and more….. the more the crowds, the more powerful and party and its leaders become !!!!! Recently, the Lucknow bench of Allahabad high court banned caste-based rallies and conferences in Uttar Pradesh. “We stay caste-based rallies throughout the state of UP,” the court said, issuing notices to the Centre and state government, the election commission, Samajwadi Party (SP), Bahujan Samaj Party (BSP), Bharatiya Janata Party (BJP) and the Congress. The intention of the high court order to stay caste-based rallies might have been to check politics on caste and communal lines but the political parties in the state used it to target rivals. Bahujan Samaj Party chief Mayawati has said that despite a High Court ban on holding caste-based rallies, her party would continue to organize as they were meant for bringing all castes together and not divisive in nature. In this beautiful Nation where parties try to manipulate their support base, by bringing in loads of cadre from rural places, this move of Narendra Modi certainly appears different and stands out !! Today’s newspaper reports state that the participants will have to pay Rs.5/- to attend Narendra Modi's rally in Hyderabad; at a time, when people expect everything free and where political parties spend thousands by providing food, accommodation, travel and everything…. !! !, would somebody pay to attend a meeting……… it appears to be unique way of funding ‘Na Mo style’…..Gujarat chief minister Narendra Modi has ushered in a corporate style of organizing meetings that will ensure that the public themselves pays for the entire expenses of the public meeting scheduled to be addressed by him at LB Stadium in the city on August 11. The BJP is charging Rs 5 per ticket for the public meeting and on day one of the online registration for the meeting on Monday, about 8,000 persons signed up. Organizers are expecting anywhere between 50,000 to one lakh attendance for the meet, which at the rate of Rs 5 per ticket would amount to about Rs 5 lakh in case the party manages a full house. L B Stadium charges Rs 3.75 lakh per day for hiring and also takes a deposit of Rs 5 lakh which will be refunded after deduction of the electricity expenses. "If the BJP gets it right, then the entire expense for the August 11 public meeting will be borne by the public themselves," noted analysts. While the online registration for the public meeting is already on via the party's official website, Facebook and Twitter, ticket sale counters are to be opened up on July 20 to facilitate the sale of tickets. "We plan to open about 500 such ticket counters in Hyderabad and about a dozen each in the district headquarters. The money raised by the sale of tickets will be utilized for charity purposes," said state BJP spokesperson. Dubbed the 'Narendra Modi Nav Bharat Youth Conclave', the rally was originally scheduled for July 27, but was postponed since voting for the second phase of panchayat polls is scheduled for the day. While the entry has been restricted to the age group between 18 and 40 years, the organizers said youth from rural area are the main target while students and working professionals would form a sizable chunk. It is a public meeting outside his strong bastion and still Modi is not afraid of making it ‘paid-attendance’…… Following Hyderabad's youth conclave, Narendra Modi is scheduled to address a farmers rally at Rajahmundry in Andhra region sometime in September, following it up with another public meeting in the Rayalaseema region. However, unlike the Hyderabad Youth conclave, the farmers' rally at Rajahmundry and the public meeting in Rayalaseema are open to the public free of cost.